Notebook app Evernote has updated its offerings with a feature that can digitise notes and drawings in new Moleskin pads. 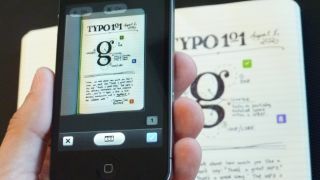 The notebooks, released in October, will be made with a special kind of paper, which will enable Evernote users to take a photo of the page and scan for text. The data from the page will be stored within the virtual notebook and will be synced with the user's other Evernote-enabled devices. Users can also place stickers on the physical pages so particular pages to be saved to certain folders within the digital locker. The new hook-up between the two companies aims to bridge the gap between digital and paper notebooks, while Evernote seems to have ended its war on paper. "This is a fight that many people in the technology space have been fighting," said Evernote CEO Phil Libin. "We are announcing a cease-fire." The functionality in the new app is tailored for the new Moleskin notebooks, but not limited to them. Moleskin's Evernote-enabled notepads will cost £24.95 or $29.95 for the larger offering. They'll come with a three month subscription to Evernote Premium.